Little Terns - Review of 2017 season. The Little Tern colony at Gronant had an excellent season in 2017 with a record number of breeding pairs (161) and the second highest fledgling count of 202. The increase in breeding pairs, up from 141 in 2016, was unexpected as we had five relative poor years from 2011 to 2015 with fledgling success and in the past that meant a subsequent dip in breeding pairs. For example, looking at the graph you can see two poor fledgling years in 1997 and 1998 resulted in fewer breeding pairs in 2002 whilst a very poor year in 2001 saw less breeding pairs in both 2004 and 2005. The increase in 2017 could be explained by high adult survival in the wintering grounds and on migration, and/or immigration of breeding birds to Gronant from other colonies because of ideal breeding habitat and good feeding. Or maybe the colony is still benefiting from the record breaking season of 2010. 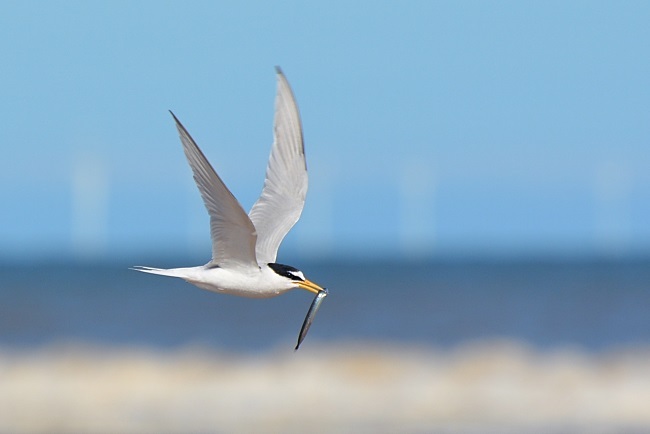 According to the RSPB, Gronant was the largest Little Tern colony, in terms of breeding pairs, in the whole of the British Isles in 2017. But it wasn't the most productive with that accolade going to Kilcoole, just south of Dublin, with 141 pairs producing an estimated 255 successfully fledged young. Kilcoole is only 100 miles due west of Gronant and there appears to be quite a lot of inter-change between the two colonies. We know this because a big effort has been made to colour ring Little Terns over the past two or three years and there were no less than 56 records of birds ringed at Kilcoole at Gronant in 2017, including newly fledged young birds. Colour-ringing is going to revolutionise our understanding of these birds but a couple of fascinating facts have already emerged - a bird ringed as a chick with a black ring in 1991 was recorded at Gronant in 2017 which means it is 26 years old, a world longevity record for Little Tern (previous record was 23.8 years), and the other interesting finding was that several one year old birds, including five ringed at Gronant in 2016, were recorded as well as several two year old birds. Perceived wisdom had it that the first year birds all stay on their wintering grounds off West Africa through the summer, as do most second year birds - well, it seems perceived wisdom was wrong! Although 2017 was undoubtedly a good year it wasn't without it's problems with some exceptional high tides, gales and not least a fox which got into the breeding pens. Quite a lot of eggs were lost to that fox but it was early in the season so the birds could re-lay but if the wardens hadn't stopped it's activities the whole colony could well have been destroyed. This just demonstrates how vitally important wardening is and, as always, a large proportion of these are volunteers. Anybody can volunteer so if you are interested please contact either the North Wales Little Tern Group by emailing nwlittletern@gmail.com or ring Denbighshire Countryside Services 01745 356197. See also Little Tern Events below. 1. Henry Cook, Ben Harrington, Sasha Taylor & Jack Slattery, Gronant Little Tern Report 2017, Denbighshire County Council Countryside Service. 4. Kilcoole Little Tern Conservation Project - littleternconservation.blogspot.co.uk. 5. Little Terns and Sea Holly, Three Summers at Gronant Dunes by Judith Samuel. A lot fewer colour-ringed birds this spring compared with 2017 when northerly winds delayed the migration. 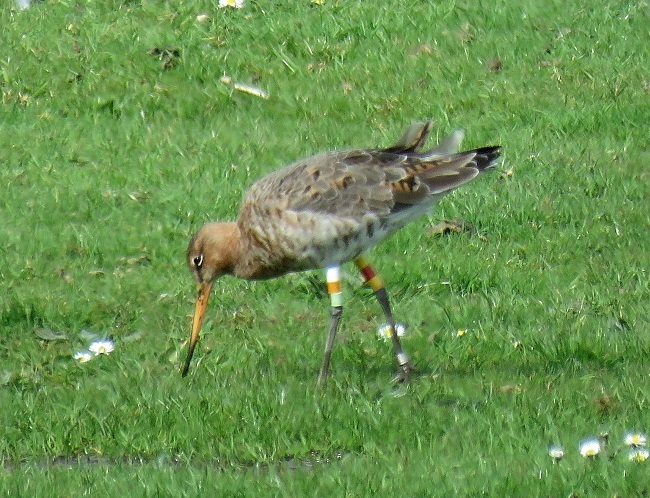 The godwits were already in full breeding plumage by the second week of April and we had a couple of interesting ringed ones, as described below. WOL-YRY Ringed on Seaton Marshes, Devon, on 9th February 2013. Between 6th April and 14th April recorded five times at Caldy Wildfowl Collection and twice on Thurstaston Shore. This is the first bird recorded on the Dee estuary which has been ringed in Devon. Apart from a trip to Dorset in early June, this bird spent the whole of 2013, including the breeding season, in Devon suggesting it was an immature (i.e. non-breeding) bird when caught. All records for 2014 to 2016 were also in Devon. This bird wasn't seen anywhere between July 16th 2016 and April 2018 until it turned up at Caldy. L//L-L Ringed in southern Iceland in June 2003, as a chick. August 2003 saw this bird in Yorkshire and in December 2005 it was in France. The first Dee estuary record was in September 2005 and since November 2006 it has been recorded here almost 200 times, but nowhere else. It was on Thurstaston shore November and December 2017 but hadn't been seen since until it arrived at Caldy Wildfowl Collection in early April 2018 where it stayed for the rest of the month. Oflag(EM) - P Ringed at Altcar (Alt Estuary) on 30th March 2018. Recorded on Meols Shore on 7th April 2018 and at Southport on 14th April 2018. 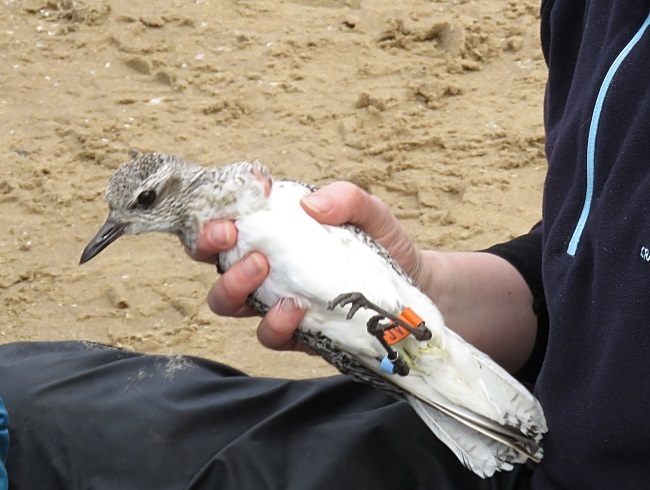 On Good Friday 2018 78 Grey Plovers (along with a large catch of Knot) were caught and ringed at Altcar and fitted with Orange flags, this was the largest catch of Grey Plovers in the UK for 20 years. There have been several sightings of these Orange flagged Grey Plovers on the Dee estuary/North Wirral but 'EM' has been the only one, so far, that was close enough to read the letters on the flag. 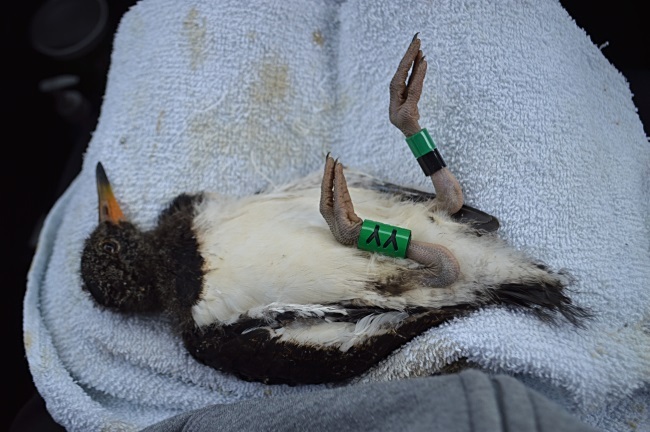 Two Oystercatchers ringed in Iceland were seen in March and April, to read about this colour-ringing scheme see: http://www.deeestuary.co.uk/news0417.htm. Metal ringed as a small nestling on 25th May 2016 in southern Iceland, then colour ringed on 16th June 2016 as a large chick just before it fledged. Only record since June 2016 was on Hoylake Shore on 29th March 2018. Ringed as a chick on 28th May 2017 in southern Iceland, and recorded at the same site in June 2017. Recorded at Thurstaston Shore on 19th April 2018. Colour-rings were also recorded by Steve Hinde, Eddie Williams, Matt Thomas, Steve Williams, Derek Bates, Allan Hitchmough and Tim Kinch. 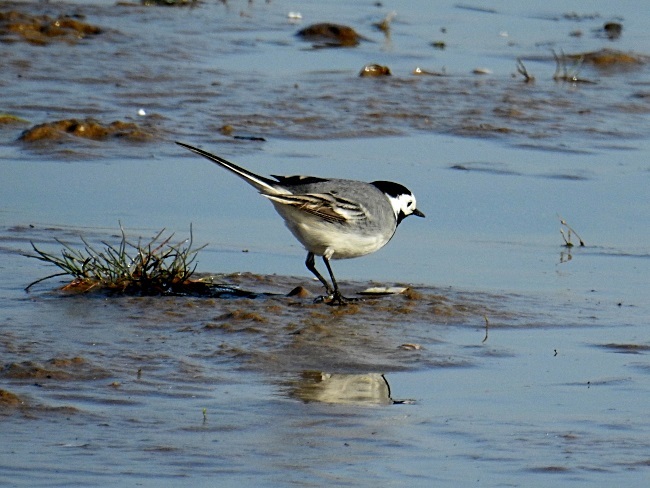 One of the many White Wagtails on Hoylake Shore, April 9th © Jane Turner. The spring migration was steady without being spectacular, although there were big numbers of White Wagtails moving through Hoylake Shore with three figure counts on four dates, max 300+ on the 16th. 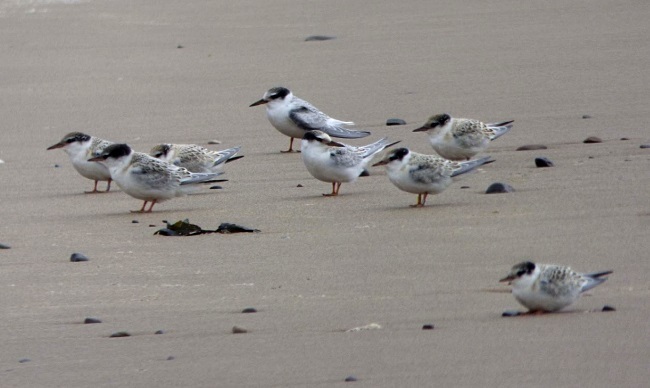 There were also 40 on Hilbre on the 16th, over 20 at Leasowe Lighthouse on the 19th and 30 at Gronant on the 29th. The table below shows the first arrival of some of our commoner migrants (plus Cuckoo which is now scarce), apart from the early Wheatear arrival dates were not untypical for recent years. Wood Warblers are getting quite rare these days so it was good to see a nice showy one at Leasowe Lighthouse on the 15th as the photo shows, first one there for many years. One singing male (there were some reports of two?) was in the wood by the Reception Hide at Burton Mere Wetlands from 20th to 25th. 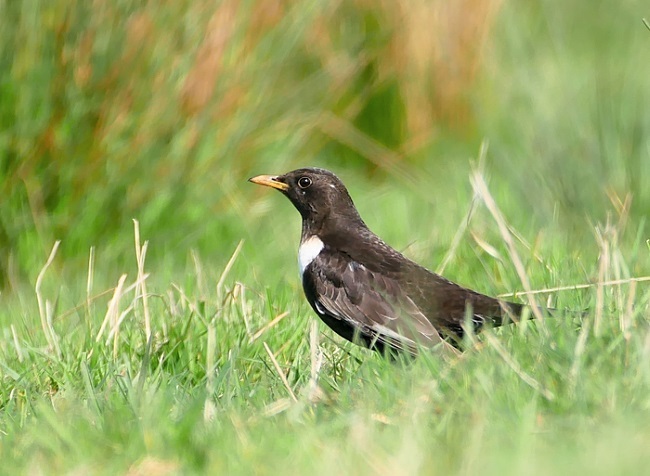 It is always good to see Ring Ouzels and Common Redstarts and we had plenty of both with the first of the former on the 3rd and the latter on the 9th, a lovely male Ring Ouzel stayed at least a week at Leasowe Lighthouse see photo below. The first Whinchats were early arriving on April 9th, Yellow Wagtails were a bit thin on the ground, the first one was seen on the 14th with just one or two since. A Green-winged Teal was on Heswall Shore from the 19th to 24th giving good views, we think a first for that part of the estuary. A white-morph Snow Goose was on Burton Marsh on the 24th and 25th, with several hundred Pink-footed Geese. Pink-footed Geese are known as 'carriers' for this species so it is a possible wild bird, although it's origin as a feral or escaped bird is probably more likely. Over 8,000 Pink-footed Geese were recorded heading north through the month, mainly at dawn, a spectacular sight. Having been present all winter two or three Eiders were present off Hilbre all month and it was presumably two of these which were seen off Heswall on the 28th. A Long-tailed Duck was spotted off the north end of Hilbre on the 18th. There were several reports of a single Red Kite over Wirral, both early in the month and in the third week. 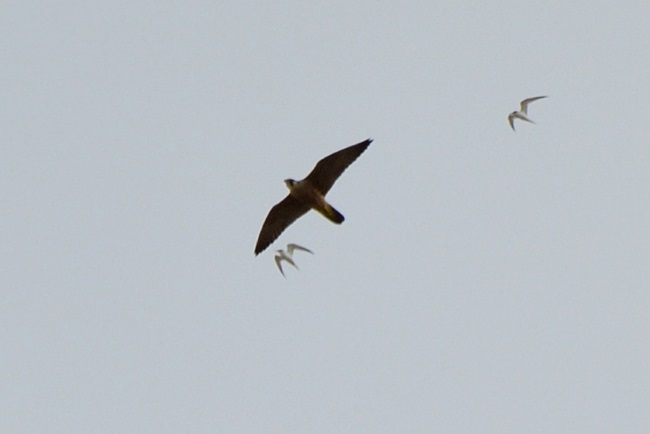 I'm told they are breeding on Halkyn Mountain (inland of Holywell) so perhaps they are coming over from there. 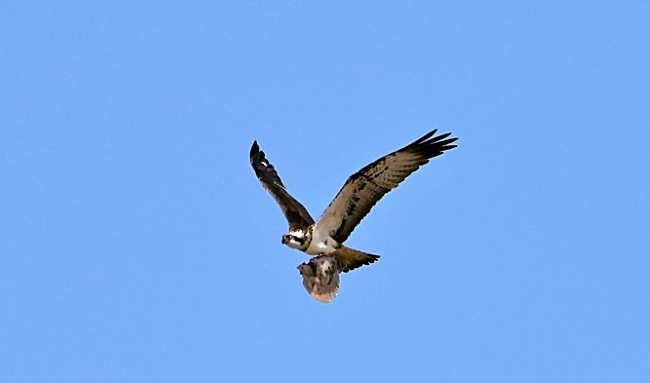 Ospreys were recorded on four dates, including excellent views on two consecutive days at Leasowe Lighthouse including one landing on the shore and eating a fish. Whimbrels peaked on the 27th with 49 at Heswall and there was a record 155 Avocets at Burton Mere Wetlands right at the end of the month. Out to sea there were three Great Northern Divers and 42 Red-throated Divers off north Wirral/Hilbre on the 17th. The most unusual record of the month was of a White Stork over Burton Mere Wetlands on the 9th. Many thanks go to Dan Trotman, Mark Garner, Jeremy Bradshaw, Jane Turner, Barry Barnacal, Timothy Kinch, Chalres Farnell, Mark Woodhead, David Haigh, Steve Hinde, Matt Thomas, Chris Butterworth, Roy Lowry, Elliot Montieth, David Leeming, Alan Hitchmough, Steve Williams, Dave Edwards, Derek Bates, Eddie Williams, Allan Conlin, Karen Leeming, Geoff Robinson, Julie Rogers, Colin Schofield, David Peate, Sheila Ryde, Frank Burns, David Thompson, Mark Gibson, Mark Turner, Graham Connolly, Paul Mason, Linda Platt, Richard Beckett, Richard Whitby, David Small, William Keig, Simon Dowell, Geoff Hawkins, Graham Thompson, Richard Speechley, Sean O'Hara, Stephen Burke, Ian Goldstraw, Jeff Stephens, Rod Bell, Clive Part, Gill Jakeman, John Jakeman, John Watson, Chris Wilding, Henry Cook, Jason King, Steve Liston, Gill Walker, Janine Johnson, Hugh Stewart, Neil Mcmoran, Roger Jacobs, John Kirkland, Pam Stackhouse, Loren Miller, Jenny Duff, David Wilson, Andrew Dean, Barry Darby, Mike Coupe, Susan Schofield, the Lighthouse and Wirral Birding Blog, the Dee Estuary Wardens and the Hilbre Bird Observatory for their sightings during April. All sightings are gratefully received. May can be a great month, specially for waders. The numbers we see passing through in late spring seems to have increased in recent years with thousands of Dunlins and hundreds of Ringed Plovers and Sanderlings. At this time of year they seem to prefer the outer edge of the estuary along north Wirral, Hilbre and across to Gronant. In these flocks we can get much rarer waders and over the past few years these have included Broad-billed Sandpiper, Buff-breasted Sandpiper, Dotterels, Little Stints and Curlew Sandpipers. Plenty of Whimbrels will still be migrating north with Heswall usually having the highest number which can reach three figures. 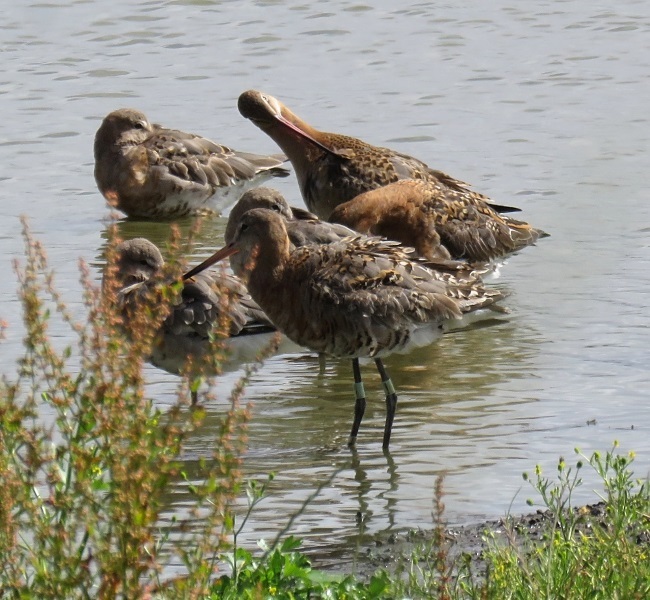 Look out also for Bar-tailed Godwits, Black-tailed Godwits and Grey Plovers all looking gorgeous in their full breeding plumage. Given strong westerlies sea-watching can be spectacular with hundreds of Gannets and Manx Shearwaters, and even on still days we can get good numbers of Great Crested Grebes and Common Scoters on the sea. We look forward to the return of the Spotted Flycatcatchers, always the last of the migrants to arrive, and Whinchats can reach double figures. May is the month of migration 'over-shoot' which means we can get almost anything turning up and in the past few years these have included Nightjar, Nightingale, Hoopoe, Sub-alpine Warbler and Red-rumped Swallow. 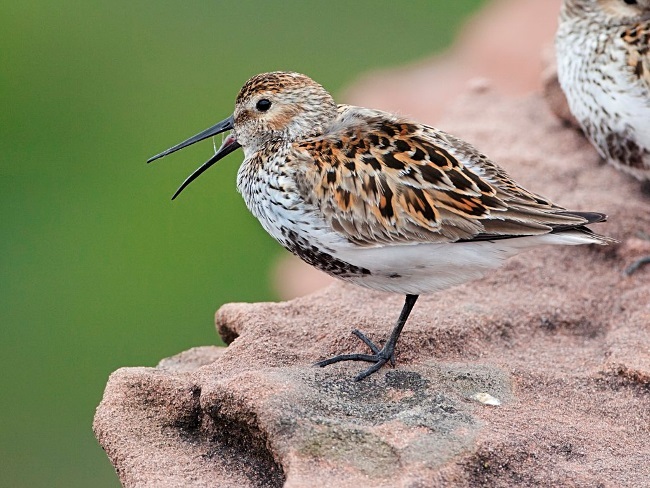 Dunlin in summer plumage, Hilbre © Matt Thomas. 16th May, 12.28hrs (BST), 9.6m. 17th May, 13.12hrs (BST), 9.7m. Feel free to just turn up at these events but if you need further details please email nwlittletern@gmail.com or ring Denbighshire Countryside Services 01745 356197. For the events actually at the Little Tern colony in Gronant Sand Dunes please park at the car park opposite Crofters Pantry Cafe on Shore Road, Gronant (Shore Road is sign posted 'Lower Gronant/Presthavens' from A548). Walk over the railway bridge and turn left through the five bar gate opposite Presthavens Sands Holiday Park, to the right you will see a footbridge over the river which you walk over to reach the dunes. Also see Gronant Site Guide which includes a map. Anybody can help with the preparations for the new season at the only Little Tern Colony in Wales, and one of the most productive in the country thanks mainly to the volunteers and wardens doing such a fantastic and important job. I would recommend bringing refreshments, sturdy footwear and warm clothing. 1st - 4th May: 10 am start - Electric fence construction at the Little Tern Colony in Gronant Dunes. Sunday 6th May, Dawn Chorus at RSPB Burton Mere Wetlands. Booking essential - ring 0151 353 2720. It's International Dawn Chorus Day, so join us at Burton Mere Wetlands to experience the magic of the reserve waking up as the sun rises. With a wonderful mix of woodland and wetlands, there's no better place to experience the early morning birdsong. An expert guide will help identify the bird calls and songs around you, plus all the other kinds of wildlife that makes its home here. Enjoy a hot drink afterwards in the Reception Hide, then a chance to explore the rest of the reserve on your own before it opens at 9am. Advanced booking and payment essential. 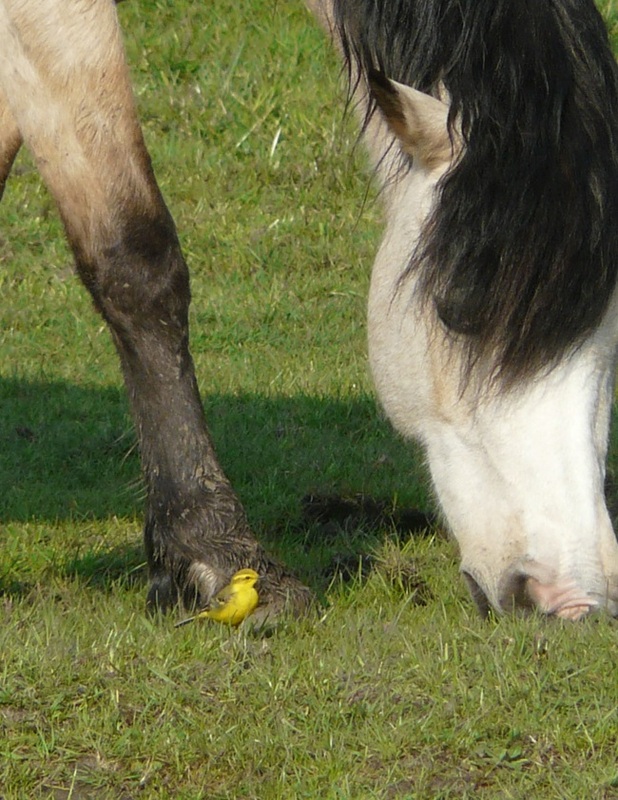 Sunday 13th May, Burton Marsh (RSPB) Birdsong and Breakfast. Meet at the junction of Station Road and Denhall Lane, west of Burton village. Join us for this exclusive event as part of Wirral Walking Festival; a gentle walk along the Burton Marsh Greenway as far as Burton Point before retracing our steps to Denhall Lane as far as Nets Cafe for a full English breakfast. 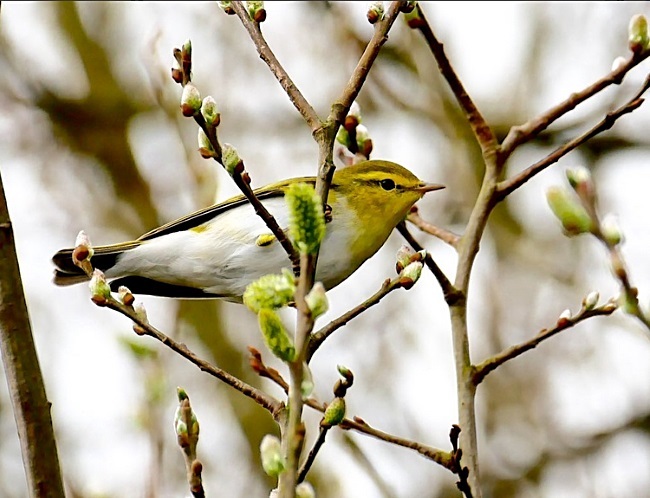 A variety of warblers are busy establishing breeding territories here at this time of year, whilst the marsh is peppered with other summer migrants such as wheatears and alive with the songs of skylarks and meadow pipits. This early morning walk will offer chance to see and hear the marsh coming to life for the day in this busy time for nesting and migrating birds. The route is along a fully accessible paved track. Booking and payment in advance essential. Price includes breakfast at Nets Cafe.